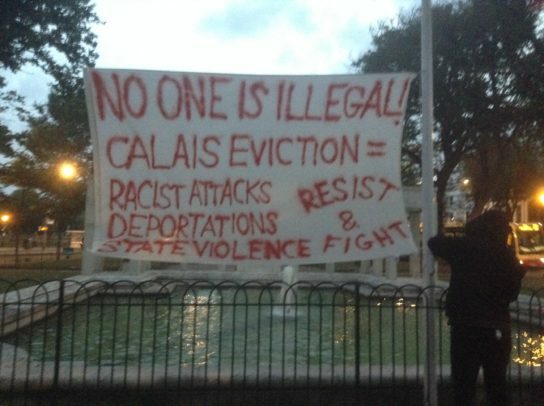 ‘we got up nice and early this morning to put up a banner expressing solidarity and anger towards the situation in Calais where, on 17th October, the French state have planned to begin a total eviction of the jungle. The banner was attached to the flagpoles in front of the war memorial in the centre of the city, somewhere that people regularly go to visit to remind themselves of their nationalist pride and identity that has been built on war, genocide, displacement, criminalisation and conquerence of other people. We want to show solidarity in this small way not just with the people in the jungle but in all places where people are trying to get on with their lives in the face of such incredible and brutal opposition – the peeps on strike/resisting within prisons all over the place, everyone fighting some serious battles against the Dakota access pipeline, autonomous zones under attack, the list is endless. From Rabble: Fascist scum are attempting get-togethers in the coming weeks in the seaside towns of Dover and Brighton. On Saturday 28 May, neonazis are planning not just another daytime stumble around Dover town, but also a Blood and Honour gig in the evening. The weekend after, on 4 June, there is a planned march by the “South Coast Resistance” in Brighton. See anti-fascist call-outs below for further details. May they drown in the seas of their own tears. The Nazi South East Alliance are coming to Dover on 28 May to spread their message of hate towards refugees, people of colour, LGBTQ people, Muslims, Jews and other minorities. Their world view envisages an all-white Britain. They plan to hold a demonstration in Dover during the day and hold a Rock Against Immigration (Blood and Honour) – Nazi gig in the evening. Blood and Honour is a Combat 18 organisation – whose rallying cry is ‘Aryan Unity’.They have been involved in murder, gun-running and terrorism. Despite the South East Alliance claiming they’re coming to Dover for ‘ordinary people’ they are instead aiming to promote an extremely violent Nazi programme – similar to the murderous policies of Hitler. The Anti Fascist Network is all about getting out of our armchairs and on to the streets, so here’s a run through of what’s coming up. How will anyone know you oppose fascism if you don’t get out there and say so! The annual March for England portrayed as a patriotic protest on St Georges day is an excuse for the fascist scum of the EDL (English Defence League) to plague the streets of Brighton. This year they got was coming to them when they were out numbered by 2,000 anti-fascists coming from all across the country. The march this year was shortened due to the collapse of the road at the sea front. (even nature did not want the fascists to march) As usual the march was confronted on its route but restricted by a massive police presence with forces even being shipped in from as far as Cornwall. Also included on the day was the much loved TSG (Tactical Support Group, extremely violent militant police unit) and extensive fencing that included mobile barricades that closed off all streets reaching the beach front where the march was proceeding. A roadside demonstration held by the Christian group “Society for the Protection of Unborn Children” at Preston Park was met with a spontaneous anarchist counter mobilisation. The anarchists masked up and surrounded the protesters quickly, destroyed a large portion of their anti-choice propaganda and dispersed again before the police could arrive. On September 3 2012, some people were arrested for being in a derelict building under section 144 of the Legal Aid, Sentencing and Punishment of Offenders Act. They are up for pleading not guilty and fighting this stupid new law. The three defendants are booked in for a two and a half day trial at Brighton Magistrates Court which starts at 10am Monday April 22 2013. There will be a protest outside court. The charges originally were squatting (under s144), obstruction (of the police in their lawful duty) and abstraction (ie stealing electricity). The abstraction charge has already been dropped. “Barclay Capital is the market maker for ITT Corporation on the New York Stock Exchange – see here. This week a Barclays cashpoint in Brighton was sabotaged in solidarity with the victims of ITT Corporation. ITT is EDO MBM’s parent company. ITT and EDO supply components to Israel for the F16. In the last fortnight Israel has escalated F16 attacks on the Gaza Strip.